We do not allow full articles to be posted, but I think all will agree this is one that needs to be posted in full. I would hate for the article to disappear in the future, because it is about saving ones life during a quake. Knowledge in different scenarios may save your life. 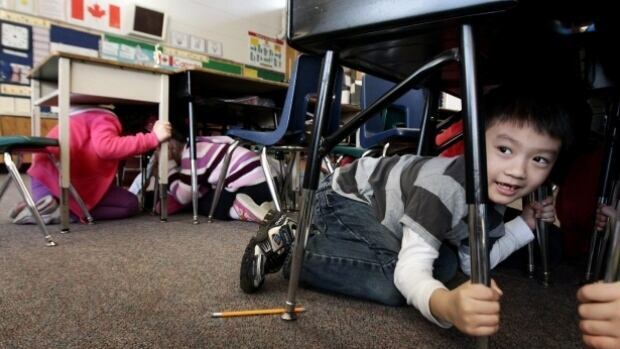 The Great British Columbia ShakeOut drill advises residents to "drop, cover, and hold on"
The Great British Columbia ShakeOut, the province's largest earthquake drill, takes place on Oct. 20 at 10:20 AM, with over 790,000 B.C. residents registered to participate. While most people know to "drop, cover and hold on" if they feel the earth begin to shake, keeping safe may not always be obvious if you find yourself outside of your home or workplace when an earthquake hits. Myles said that if you feel an earthquake when you're in the shower, you should apply the conventional wisdom to get down and hold on as best you can. "You don't want to run out of the shower, you want to drop down and stay in the tub." She recommended securing your bathroom by ensuring that there are no heavy objects hanging near the bathtub. If you find yourself in an underground parking garage, Myles recommended taking shelter by "tucking up against an interior wall, up against a pillar, or even staying in your car." Many people who have experienced earthquakes while driving say that they initially thought that something was wrong with their car, causing them to slow down and pull over, which is the safest thing to do. You should then stay in your car, but make sure not to stop on a bridge or under an overpass. Myles also recommended tuning into the radio for updates, and keeping an emergency kit in your car. Myles said that walking down the sidewalk, or being immediately outside any building, can be one of the most dangerous places to be during an earthquake. "You want to be really aware of your surroundings and this may be the one time where you do want to tuck inside into a doorway," she said. This will best protect you from broken glass or other falling debris. In an retail space, the key is to avoid objects that may start flying off the shelves. "If you're in an aisle where there's lots of stuff that could fall on you, you want to get low, so drop to the ground, and then crawl to the end of the aisle or use something nearby to protect you, like your shopping cart for example," Myles said. If the shelves are large enough, you can also climb onto the bottom rack for protection. Myles said that like motorists, SkyTrain riders may not initially notice that an earthquake is occurring. She recommends staying where you are, getting low, and holding on until the shaking subsides. Riders should not venture onto the tracks, but wait for assistance or instructions about how to exit the train safely. In situations where there are crowds, Myles said it is crucial to remain calm, drop down and hold on to the seat in front of you. To avoid stampeding once the shaking subsides, you should follow the instructions of the people managing the event space, who will know the safest evacuation routes. For our American members - Check with your individual states for more local information, but the basics are all the same. Be prepared now, before it's too late and you are in trouble.